There is an ongoing debate about budget cutting in the world today, because revenue coming in is not matching the promise Governments made to their people of availability of pensions, unemployment support, and health services. This problem is particularly acute in countries whose populations are getting older faster, like Finland and Germany. Who would suffer most if crude across the board cuts in Government social spending were made were made? The table below, which appeared in a recent OECD report, shows up some surprising results. In some countries the top fifth of income earners are the biggest beneficiaries of social supports in the form of cash payments from Government! 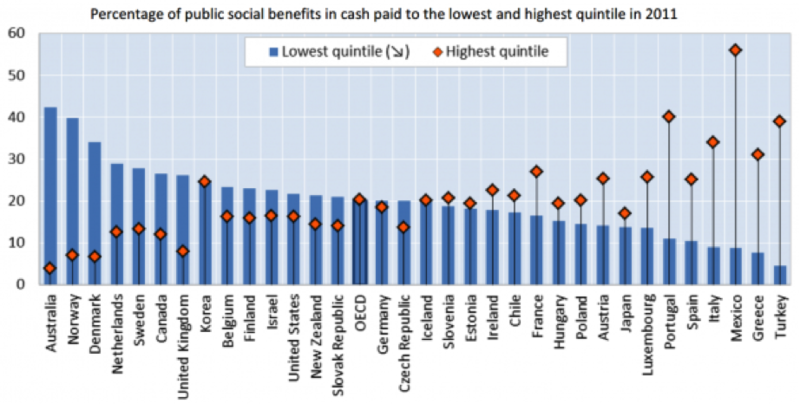 In fact, France, Italy, Austria, Portugal, Ireland and Spain give a higher share of their cash social supports (pensions, unemployment and disability supports) to the top fifth of their population than to the bottom fifth. The share of cash benefits paid to households in the lowest income fifth of the population is highest in Norway and Australia at 40%, compared to around 10% in Mediterranean countries and 5% in Turkey. In these latter countries, social transfers often go to richer households, because these benefit payments are often related to a work-history in the formal sector, and often concern pension payments to retired workers. Earnings-related social insurance payments also underlie substantial cash transfers to the top income fifth in Austria, France and Luxembourg. Some governments do less “social spending” in places where the private sector fills in the gap, particularly when it comes to pensions and health insurance. In the Netherlands, Denmark, the US, and the UK, for example, private pension payments are worth about 5 per cent of GDP each year, while American spending on private health insurance is worth nearly 6 per cent of GDP. Pensions paid by government are 5.3% of GDP in Ireland, and 5.6% of GDP in the UK, but they are 13.8% of GDP in France, 14.8% in Greece and 10.6% in Germany. In contrast, income support by Government for those of working age are 8.3% of GDP in Ireland, as against just 4.7% in France, , 5.1% in the UK, 3.8% in Germany and a mere 3% in Greece(notwithstanding that country’s high unemployment). In Ireland’s case, it is worth noting that 40% of the unemployed who receive income support from government are long term unemployed (ie.more than a year out of work). The OECD has said that their skill levels are inadequate to the modern economy, which is a big long term concern. The longer people are out of work, the harder it is for them to get a job. I heard one person describe the experience of long term unemployment as worse than losing a spouse. Meanwhile the number claiming various forms of illness benefit has increased by 47% in the last 14 years from 150,000 to 220,000. This is surprising in light of the improvements in spending on health services in Ireland in recent years. Health spending as a percentage of GDP is 8.6% in France, and 8% in Germany as against 5.8% of GDP in Ireland, which is below the OECD average of 6.2%..But health spending is rising in Ireland and the National Competitiveness Council says that, since 2001, Ireland has had the fastest rate of inflation in health insurance costs of 17 Euro area countries. These contrasts between countries make it harder to devise a common economic policy, even for the countries who share the euro as their currency. For example, a recent study in Germany showed that the average immigrant to that country pays 3300 euros more in taxes and social contributions than he/she takes out in benefits. In fact immigration yields a 22 billion euro surplus to the German taxpayer. Yet 66% of Germans believe immigrants are a burden! The same applies to the UK. In countries where government spending goes to the well off, one can expect well placed interest groups to be particularly effective in resisting changes or reductions in expenditure. Another conflict of interest will be between households with high debts, who are finding it hard to meet their obligations, and households who have made significant savings over the years, and who wish to protect the value of those savings. Household debt, as a percentage of household disposable income, is 326% in Denmark, 288% in the Netherlands, and 230% in Ireland..as aginst 58% in Poland, 90% in Austria, and 94% in Germany. For example, a policy that favoured low interest rates and inflation would benefit the debtors, but hurt the savers. The savers would also have an interest in protecting the value of the bonds issued by banks, companies and governments in which their pension and insurance funds are invested. Debtors, on the other hand, would be more relaxed about “burning “ these bondholders. These genuine differences of interest need to be brought out into the open because there are reasonable concerns on both sides of the argument.